ACWKGYTO, Audib5fan, Broonie22 and 33 others like this. Hereford right? I parked in the same space when I was on a course the other day! 2014 A3 184TDI Sportback S-Line, Manual, Daytona Grey - with Roof rails! No. I don't want to be too specific, but it is in South Cheshire. Obviously- Looks so similar though. Same trees, surroundings and parking surface! South Cheshire, I'm North staffs! That's just too dangerous for me.......cars could park either side of you. AudiNutta and irowpod like this. I do that then when I come back some prune has parked right next to me. What's that all about? mark351, albu, Minion Bob! and 3 others like this. I used to do this, however no matter where I park someone ends up next to me anyway, I reckon on purpose. mark351, Mythos, robps3 and 2 others like this. I once parked on the 12th (top floor) of a multi-storey car park when there were largely no other cars above floor 8. AudiNutta, pistol pete, RedTurtle and 2 others like this. Wemo 1973, Splathead and RedTurtle like this. Just parked like this in a tesco car park. No cars for at least 10-15 spaces. Came back out and a some crappy little Toyota with a spare wheel had parked badly next to me! FBF01 and irowpod like this. I've always used the extreme ( furthest away ) parking method. The missus use to moan and criticise me for it. But the evidence spoke for its self and she has developed this for of OCD too. But I've at the moment a three year old car with not a single door ding. I go for spots too where the "garden" stop/ starts, going right up to the kerb and protecting one side. I know, I know, I'm a sad sad person, but I'd rather keep the doors ding free. mark351, robps3 and irowpod like this. Yes, yes, yes..........I'm not crazy after all. Thank you for confirming this. I also like the "garden" stop/start approach. Also, what I didn't mention in my original photo is that there is a very slight and gentle ledge on the far side. I actually parked into this in order to give extra space between my car and the line/space next to me. Ok.....I concede.........maybe I need help! Talking about little Toyota's this one was parked by a lady , I initially thought she was quickly posting a letter . Coming back from town it was still there ! I don't know if this is a result of previous kerb rash or a genuine parking disability but I have never seen a car parked so far away from a kerb before . This is made worse by the Highway Codes rule of no parking opposite a junction ! What is a garden Stop start method? I was having a chat about that rule with our local PCSO. I was asking why they didn't ticket people opposite junctions and with in what ever the distance is. His reply was, " if we did it for one we'd have to do it for everyone ". Unbelievable !!! I couldn't be bothered to reply, but if they see something like that that should be doing it anyway. Simply letting them do it !!! GGRRR it pee's me off something wicked. Well, let's see if I can explain it. When your in a car park it's where the last marked bay is, usually by the side is a wood chipped / shrubbery area all kept in place by kerb stones. So you can park tight up to the kerb, get out in the shrubbery and leave a decent space to the lines of the next bay. TomBlueS3 and JohnM100 like this. If I cant find a space I'm comfortable with I'll go home.............. 'er indoors is never pleased about that. SILVAF0XX, AudiNutta, nervus and 2 others like this. I've always parked where (hopefully) no-one can accidently ding my doors or bodywork - parking next to cars with baby seats in is an absolute no-no! Often these places are the furthest away one can get and my missus used to moan like hell. That is until she got her brand new A1 a few months back, and suddenly she does the same............"just in case"
Went to Costco today, 36 x ultra plush microfiber towels for £10.78 40.6cm x 40.6cm. Can't go wrong even if you only use them once and then bin them for that price!!! JohnM100, Madmo, irowpod and 1 other person like this. And yes I made sure the stuff under the cover wasn't in use...it was old...very old. I also checked the tree for any obvious broken/loose branches! What we do to keep them safe!!! Broonie22, Audi Bairn, mcwharam and 12 others like this. hahahahaha this is brilliant!! Love the thread title as well. Dont you actually worry about it being way too far from eye sight and could be easily get into somebodys hands without anyone noticing? Did you check the tree for birds. I parked on my friend's drive last week and ended up with a red and white roof!! Nope, because there was a monitored cctv camera and floodlight pointing straight at it from just behind where I was standing to take the pic When we came out this morning there was a white Audi A5 convertible parked 3 spaces down from me (which I pointed out to the other half ). Even without cameras, I'd rather take the chance of parking further away over coming out to find some idiot has dented the entire side because they can't park and then just driven off! need them merging by a mod. Same issue each day at work, conducted an awesome lonely-park the other day though, well chuffed, then realised the tree sap was not factored into this, it was like the windscreen wipers were made of sand paper! 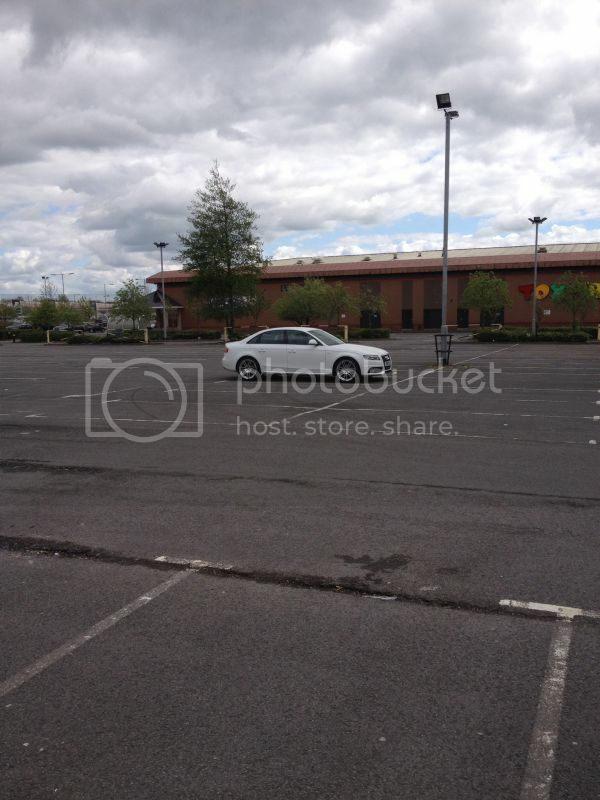 A few years ago I parked in a PC world car park in Hull at 8 in the morning it was virtually empty. 15 minutes later having just bought the latest Tomb Raider (said it was sometime ago) I emerged from the store to find a young mum struggling to get a child out of the rear seat because she had parked to close to me. I stood watching and waiting to get into my car, when she noticed me I said "why" to which she just shrugged her shoulders. Tango Red Black Edition. Pano Roof. Folding Mirrors. B&O Sound. umm, Rob2k68 and RYuill like this. slayaz and elpaulio like this. Went to my nans. Unfortunately parking there involves many massive trees with lots of birds and leaves etc so outcome some old bed sheets! Paintwork was clean as when I got there well worth the effort ! Ordered 3rd Nov 2014 - Sepang Blue S3 Sportback S-Tronic, Comfort pack, Cruise Control, Rear Parking Sensors, Tech Pack, Audi Sound System, Privacy Glass. Collected 18th March 2015 135 days after ordering ! Djs3saloon and Muttley75 like this. HectorS3, Pinky1959, SeoTFSI and 14 others like this.